00:00:00 Interviewer: [Prakhaim 00:00:00] what sparked your curiosity for pre-Arabic languages? 00:00:05 Prakhaim: You mean pre-Arabic? 00:00:07 Prakhaim: Well, when I attended the university in 1983, I started studying Arabistic, Arabic Studies. 00:00:40 in Arabic Studies usually, the traditional Arabic Studies. 00:00:52 I attended a Master program in Epigraphy. 00:01:11 or on wood, really, there are many surfaces. 00:01:34 paved my way to understand more about the prehistory of Arabic in general. 00:02:03 as well as historical facts that are not attested in the Arabic sources or in the Arabic tradition. 00:02:41 and a deep understanding about the Arabian Peninsula and its history, its religions, and languages. 00:02:49 Interviewer: You started studying that? Was it a new study? Were you the first or were you one of the first to do that? 00:03:17 and we are now more than 30 professors spread over Jordan and worldwide. 00:03:42 and cultural heritage in general. In fact, I'm okay. 00:03:55 I invested my stay in Germany to go in depth in this study. 00:04:17 and the Arabian cultural history, in addition to Levantine, and also the Horn of Africa. 00:04:34 in addition to a wide historical spectrum covered by my study, either during my MA period and PhD period in Germany. 00:05:06 Prakhaim: Yeah, of course. I mean, learning German was of great importance for me. 00:05:21 or any language you learn, is kind of a key. It's a key to the culture itself. 00:05:29 Not only to literature, but also to the people. 00:05:38 it means that you can discover the culture as well. 00:05:42 Interviewer: German is of course a living language. 00:05:45 It's a language that's been spoken by lots of people in Germany and abroad. 00:05:49 You went on in studying languages that are pre-Islamic? 00:05:54 Prakhaim: Yes. In fact … Well, yes. 00:06:00 If you know the system of a certain language, then it will be easy for you to learn other languages. 00:06:10 I talk now about the grammar of a language. I'm not talking about the script. 00:06:19 Yes, I had the background how to deal with languages in German. 00:06:36 and publications in German. 00:06:54 Prakhaim: If I say generation, I mean the generation in Jordan. 00:07:02 Europeans took care about this 100, 200 years ago, since 200 years. 00:07:20 or in Levant, the Europeans were pioneers in this regard, I'll say. 00:07:40 got the same experience and the same information they gained, I mean, the Europeans has gained before. 00:08:17 and draw conclusions from the text, either on the linguistic, cultural, or any other level. 00:08:25 Interviewer: I can imagine that such a beautiful thing that you discover through inscriptions,. 00:08:30 through understanding languages, that you're discovering former cultures and former ..
00:08:38 Prakhaim: Yes. In fact, inscriptions are repositories of ancient history. 00:08:53 or the locality where the inscription is found. 00:08:56 In certain cases, you can date the site, an archeological site, through the inscription. 00:09:43 but not in exact details. 00:10:03 of great importance to understand the human creativity..
00:10:08 Interviewer: When you decipher such an inscription, what does that do for ..
00:10:19 It opens a window to a culture that was once here? 00:10:25 Prakhaim: Yeah, of course. 00:10:43 historical facts about the region where it is discovered. 00:11:05 that you are the first from this region to do that? What does that say of …? 00:11:10 Prakhaim: It means a lot. 00:11:50 they lack the cultural background. I have to say that frankly. 00:11:58 therefore their understanding of the entire story is a little bit vague. Now, in fact, we are not working alone here. 00:12:20 and we exchange opinions about certain issues in this regard. After that, we reach a conclusion. 00:12:36 Prakhaim: Yes, from the same region. Yeah. 00:12:40 Yes, but I have to say my European colleagues also help in different regards, in different perspectives. 00:12:51 We conduct joint surveys. We conduct also joint studies together. 00:13:02 but also from the cultural perspective because it’s important to get in contact with our European colleagues. 00:13:19 which means that we can do more for cultural understanding as well. 00:13:41 that makes you a … that I can imagine that’s a very special role you have. 00:13:47 A very important role, a very special role. 00:13:49 Prakhaim: Yes, I personally can’t evaluate myself, whether I have a special role or not. 00:13:57 It’s the academic world which would decide this..
00:14:06 Interviewer: No, but what you do is you shed light on times that people here seems before not know much about. 00:14:16 At least, how do you see that? 00:14:19 Prakhaim: Yeah, that is true. Yeah, this is true. 00:14:46 and also to reach reliable conclusions. 00:15:20 who lived in this area for a long time, they existed after that. 00:15:27 What I’m talking about is the change of political entities while the people are the same. 00:15:33 The people are the same, and they also continue to live in this area, in this region. 00:15:55 or a certain subject in our cultural history in general. Studying the past is connected with our living heritage. 00:16:12 We cannot separate them. 00:16:24 Interviewer: Why is it? Why is it that you are one of the first to do just that? 00:16:39 but I think it’s important to have a generation here who is interested in its cultural heritage and cultural history. 00:17:13 why is it that those times … what makes those times were not seen or not accepted or not embraced before? 00:17:57 for example, to ancient South Arabian epigraphy or ancient North Arabian epigraphy or Novatian epigraphy. 00:18:06 We are talking about a 200 years old discipline, not that ancient. It’s not that old. Yeah. 00:18:37 they didn’t have the access into such an epigraphical source. 00:18:53 as well maybe oral history as well. It’s also important. 00:19:00 I mean, oral history is important to understand ancient cultures because the same people are still living. 00:19:07 I mean, the same people who established the ancient cultures, their descendants are still there. Yeah. 00:19:26 where we can take into consideration the epigraphical sources, the archeology, in addition also to a living heritage. 00:19:52 I suspect, because you bring them the stories of those days? 00:19:57 Prakhaim: Yes. Yeah, and now we have a new window to ancient history of the Arabian Peninsula. There is a new one. 00:20:12 deciphering the ancient Arabian and Semitic inscriptions in general. Yeah. 00:20:23 they are taught in a way that they don’t understand those times before. 00:20:29 Interviewer: How do they see that era when they come in your faculty? 00:20:37 Prakhaim: Yeah, that’s a good question. 00:20:59 and also their methodology towards studying the cultural history of the Semitic world. 00:21:06 Interviewer: What is their view when they come in? 00:21:09 How do they see them when they don’t have this knowledge, the kind of ignorant times or-. 00:21:13 Prakhaim: In fact, most of our students who are coming to the ..
00:21:30 about this and about the cultural history of Arabia and the Semitic world in general. 00:21:41 At the Institute, we train them and we conduct surveys so that they understand what we are doing in a better way. 00:22:00 how do they see in general the times before Islam? 00:22:38 et cetera, but this is in fact a little bit … I mean, the idea should be modified a little bit. 00:22:45 In fact, Arabia witnessed a flourishing culture economically and historically and culturally in general. 00:23:01 It’s our rule now to present this culture, which was hidden in the inscriptions. 00:23:07 Interviewer: That’s your role? 00:23:11 Interviewer: Present? That’s your role? 00:23:21 identity, it’s part of their history. 00:23:37 perspective, but from the civilized perspective Arabia, I think, especially the southern parts and the central parts,. 00:23:46 they are of a great importance and significance to understand the … Okay, I’m [inaudible 00:23:59]. 00:23:56 Prakhaim: I think the sources give us a new glimpse. 00:24:12 and the hidden culture of Arabia before Islam. 00:24:18 This is now evident through research and through archeological surveys, and through also studies published. 00:24:32 You have thousands of publications in this regard, but most of them in fact are written in foreign languages. 00:24:44 That’s why they are not accessible by Arab people. 00:24:57 but to present the cultural history of Arabia in Arabic world. 00:25:07 I think this is important now so that Arab people can have access to this source. 00:25:25 the worlds that had been here that before was not understood by people. 00:25:32 Prakhaim: You mean the scholarly world or what? 00:25:49 here in Petra, that this is the culture of what it stands for. 00:25:56 Prakhaim: Yes, of course. I have to say I’m not the first one in this regard, of course. 00:26:01 Interviewer: Of course. I know. 00:26:11 as I said in the beginning, they are in fact the key to cultures. 00:26:26 and you understand after that the contents of a certain inscription. 00:26:44 regarding social relations among people at that time. 00:26:48 I mean, through this knowledge, you can nurture the history of their region of course. Yeah. 00:27:01 Interviewer: Do you see that also, that there are connections between the pre-Arabic worlds and the Arab world? 00:27:12 That somehow, I mean, like … Yeah, do you see connections that before had not been seen? 00:27:17 Interviewer: Pre-Islamic worlds and the Islamic world. 00:27:20 Prakhaim: Yeah. Yes, of course. Yes. 00:27:28 and of course they got with them ancient traditions that continued until nowadays. 00:27:37 Interviewer: Do you have examples of that? 00:27:40 Prakhaim: Well, let us say something. 00:28:01 South Arabian inscriptions, they are still used in Yemen. This is a fact. 00:28:31 but people have preserved this cultural heritage and continued to transmit it. 00:28:37 Interviewer: You said also the camel burial? Or is that another …? 00:28:41 Prakhaim: No, it’s something different. 00:28:49 Prakhaim: That’s something different. 00:29:12 Interviewer: Where did your passion for languages and inscription start? 00:29:27 at Yarmouk University. At Yarmouk University. 00:29:50 and Arabistic in general in a traditional way, studying the languages not in a diachronic way but in synchronic way. 00:30:16 and the ancient history of the Arabian culture. 00:30:48 and Ugaritic. Ugaritic is one of the Bronze Age, late Bronze Age languages that existed on the Mediterranean Sea. 00:31:01 I tried to find the lexical affinities between Arabic … some scholars call the classical Arabic or standard Arabic. 00:31:09 There are different terminology. I mean, here, the Arabic of Koran and the pre-Islamic Arabian poetry. 00:31:21 I found out that there are a lot of aspects that constitute the kind of lexical similarity between Ugaritic and Arabic. 00:31:45 which we call it … It’s a hypothetical language. 00:32:16 commercial contacts, et cetera, but we have a lot of historical models to explain this similarity. 00:32:25 In general, most of the languages in Levant, the Levant and Arabia, and also in Mesopotamia, they are interconnected. 00:32:35 We call them sister languages because they come from the same origin. The origin, we call it Proto-Semitic. 00:32:43 Interviewer: To go back, what is your fascination for these old languages? 00:32:57 studying the language provide us with their right instruments to decipher cultures. 00:33:15 Professor [Rhiner Folkt 00:33:12] he is a renowned professor in this field. 00:33:16 I did with him five years studying ancient Ethiopic or old Ethiopic. Why? 00:33:24 Because I wanted to understand the relationship between Arabia and the Horn of Africa. 00:33:36 and historical phenomena in terms of relationship between Arabia and the Horn of Africa. This is an example. 00:33:57 and the Arabic culture in general. 00:34:07 Prakhaim: Yes. I was interested in languages even during my childhood. 00:34:32 and pave the way for me to get a deep information about certain aspects of our cultural history. 00:34:44 From the beginning, I was interested in languages, but I can’t say how this evolved at the beginning..
00:34:55 Interviewer: When you were really young, I mean when you were 10 or 11, how did it show? What was the fascination then? 00:35:10 Prakhaim: The fascination in languages?. 00:35:16 Prakhaim: I can’t remember. I mean, I can’t make a sense of this in this regard.? 00:35:29 Prakhaim: I don't know. I can say that we had no Internet at that time. 00:35:46 time until 1982, in fact. We had a radio and that was our window to the world. 00:36:03 Of course I heard a lot of languages in the radio. I found out later that this is German, this is French. 00:36:29 but there are certain points where the pronunciation is different from each other. 00:36:50 Interviewer: How did you listen into the radio? Can you describe? This was in the living room? 00:36:55 How did you know that you could find different languages? 00:36:58 Prakhaim: Yeah, I can’t tell you. It was in the living room of course, yes. I don’t understand your question. 00:37:09 Interviewer: How do you … It’s a radio. You hear those language. How did you do it? 00:37:11 Were you scrolling through the channels? 00:37:31 difficult to understand, for example, the Algerian or the Moroccan dialect. 00:37:49 they could be considered as languages because sometimes they have different morphology and different syntax. 00:37:58 This made me also enthusiastic to pursue studying languages. 00:38:05 In fact, I can’t classify the factors why I was interested in language from the beginning. I don't know. 00:38:13 I have no personal synthesis about this. Yeah. 00:38:17 Interviewer: You were from a family that’s also scientific interested or …? 00:38:38 they used to earn money through business. 00:38:47 and opened my eye to the academic world because he is considered one of the first graduates from the Jordan University. 00:39:16 and also worldwide. That’s why he wanted me to deviate from the career of my family a little bit. 00:39:26 Interviewer: When you [inaudible 00:39:28] described your … Well. What sparked your curiosity? 00:39:37 Prakhaim: Well, regarding languages? Yeah. In fact, I am a patient guy. 00:39:46 I have to say, I’m very patient, even from childhood. 00:39:52 I used to help my father in his store and in his business since I was seven years old, in fact. I have to say that. 00:40:13 I didn’t enjoy most of the children my age enjoyed before. 00:40:28 and he sent me first to a Roman Catholic school in Irbid. That was in 1970. 00:41:07 and even in a village nearby where … and I used to walk from my house to that village for three kilometers sometimes. 00:41:30 where usually school boys think sometimes. 00:41:35 Some of them, they don’t think about it because they have their other interests. 00:42:13 and how they can be recited in a rhythmic style. 00:42:21 I was interested also to understand the words used in such passages, poetical passages. 00:42:41 they explained some words in a traditional way, but I was not convinced. 00:43:05 we went in depth in studying the ancient Arabic poetry, but the problem, I didn’t find a solution for my problem. 00:43:23 and what are the origins of certain words in this Arabic poetry,. 00:43:33 and also to explain how a linguistic phenomena could be ..
00:43:51 within this wide Arabic context, where Arabic is used. 00:44:06 and to dig for the origins of Arabic. I found some of the answer during my MA studies. 00:44:16 My MA studies where we’re exposed to, in fact, I have to say European experience. 00:44:23 I was taught by different European professors and American professors at the Institute of Archeology. 00:44:30 and Anthropology at that time. We were exposed to ..
00:44:57 which we called Proto-Semitic. 00:45:27 Interviewer: What makes now you unique in the world? It makes you unique. 00:45:41 I’m trying to connect and to find the relationship between Arabic and its cultural and linguistic context. 00:45:51 This is what I’m trying to show not only to my colleagues, also to my students, and also to make it known abroad. 00:46:15 how to connect Arabic with its surrounding languages through ages and also the culture where Arabic emerged. Yeah. 00:46:28 This influenced, of course, my future studies and future research. I did my MA. 00:46:52 and the Levant also and of course in North Africa. 00:46:56 Interviewer: One second, what do we have here?. 00:47:07 Interviewer: What is that Adhan Asr? 00:47:07 Prakhaim: Yeah. I mean, as you know, we have Islamic prayers, five prayers. 00:47:11 This is the … We call it Adhan al Asr, which comes after afternoon. 00:47:18 Interviewer: You said at a certain moment when you were young you listened to this Arabic poetry. 00:47:29 and [inaudible 00:47:26] I'm sorry? 00:47:30 Prakhaim: In fact, it was included in the curricula of the school. Yeah. 00:47:40 and I was interested in understanding the meaning of this poetry in a proper way. 00:47:51 but they sometimes don’t understand the cultural backgrounds of this poetry. 00:47:56 I was interested in the cultural background, not only on how to be recited. 00:48:15 Interviewer: You missed that in the recital? 00:48:27 because they used to teach us in a traditional way, trying to explain. 00:48:33 They couldn’t explain the cultural backgrounds of this poetry. 00:49:14 but it represented a certain cultural phase in the Arabian peninsula. 00:49:30 and the cultural context of this poetry. Also, the Koran, the beginning of Islam. 00:49:54 because some words continued to be used …. 00:50:07 and I was interested in understanding such words in Koran and I have some research on this regard. 00:50:17 I started a project on this regard. Yeah. 00:50:22 Interviewer: To go back, do you remember the poem, the first poem that makes you …? 00:50:37 or the Jahiliyyah Age or the ignorance period. 00:50:42 For example, the poems of Antar and Zuhayr bin Abi Sulma and other poets. 00:50:52 Interviewer: Can you recite one?. 00:50:54 Prakhaim: Well, no. Not .. No. Also, [inaudible 00:50:59] and other people. Other people. 00:51:07 Interviewer: Then I'd like to go back to the last thing which you said about Koranic. 00:51:12 Interviewer: What are you doing with that? 00:51:24 Prakhaim: I mean, the poetry was definitely not connected. 00:51:37 describes their relationship with the environment. It describes also their understanding of the world at that time. 00:52:00 Prakhaim: No. I’m not finding new words. No. 00:52:18 but in some cases we can do more to understand this text through the languages that existed in Arabia at that time. 00:52:29 Interviewer: Because they have also their roots? 00:52:36 Prakhaim: Yes, of course. I mean, such words, they have their roots in the languages of Arabia before Islam. Yeah. 00:52:43 I mean, we have, for example, some words that were Arabized. They became Arabic. 00:52:58 and you found them in different pre-Islamic Arabian texts. 00:53:15 but they were Arabized. They took the Arabic shape. 00:53:24 Interviewer: You are discovering that now from your …? 00:53:28 Prakhaim: Well, I’m trying to deal with certain words and to understand them in a different lexical context. 00:53:42 Interviewer: What do you mean by that? 00:53:46 Prakhaim: I mean, to interpret them in the light of ancient Semitic languages that existed in Arabia before Islam. 00:54:28 if we reinterpret this word, it means that we … I mean, God has protected Muhammad’s heart. 00:54:40 This helps us to understand the text in a better way and it’s for the benefit of Koran, in fact. 00:55:01 Interviewer: Okay. Then we go back to when you .. We were with your students. 00:55:06 You were with your students in the mountains, looking at the stones and this enormous terrain. 00:55:24 what you can do here in this area, how do you envision that over 10, 15 years? 00:55:32 Prakhaim: Well, how do I envision my students or the field in general?. 00:55:37 Interviewer: [inaudible 00:55:36] I put the question wrong. 00:55:42 When you look in your field of work with your students, you would walk into boundaries, as what you explained before. 00:55:57 and what is it that you yourself want to find out? 00:56:29 Which aims at understanding our Arabian culture from the Arabian Peninsula and also in the Levant. Yeah. 00:56:43 and also that they continue also in training the future generations. 00:56:54 you said you were the first one that shed a light in an era where much of the people, you didn’t see the light. 00:57:02 What do you think that your students will … what kind of windows are they able to open?. 00:57:07 Prakhaim: Well, I hope .. I mean, of course they can … I don’t know. 00:57:21 but definitely they are going to contribute in understanding the Arabian culture in its widest context. 00:57:31 I'd like them to work on the history of Arabic. 00:57:40 I would advise them to work intensively on the history of Arabic as a language and culture. 00:58:03 and they have also the capability … they are capable to deal with other cultures. 00:58:12 Not only ancient cultures, also more modern cultures in the world. 00:58:18 I think they have more and better opportunity than I have, what I had before. Yeah. 00:58:24 Interviewer: A lot of stones, too. 00:58:39 and this needs many generations in the future to be prepared for this task. 00:58:48 It’s not a task of one generation or two generations. 00:58:52 We have to train many generations so that they can continue documenting our cultural heritage. 00:59:00 I mean, not only stones and inscriptions, but also archeology and tangible heritage and intangible heritage. 00:59:10 I can’t divide culture into parts. They are all interconnected. 00:59:27 we can draw a clear picture about our culture. 00:59:32 Interviewer: What are you doing now? What is your focus now? 00:59:39 Prakhaim: Now, I am involved in different projects and research endeavors in general. 00:59:51 I’m now conducting a field work. 01:00:08 [Harra 01:00:08] Region, in the volcanic region we visited. 01:00:16 I’m also trying to involve foreign institutions to work with me in this field work. 01:00:36 and from the so-called Northeastern Badia. 01:00:43 It has a lot of … I mean, the surfaces of stones constituted an ideal [canva 01:00:51] for writing inscriptions. 01:00:54 Those inscriptions were written by people who were in the area. 01:01:22 and the history of the area. 01:01:23 Interviewer: When you look around you, the whole Jordan, this was a land of milk and honey. 01:01:29 Interviewer: I mean, it’s one big archeological black hole you still have to discover. 01:01:35 Prakhaim: Yes. I mean, I’m not the only person. 01:01:54 to continue this responsibility in studying the cultural heritage of Jordan. 01:01:58 Interviewer: What I want to say, all these rocks have a story. 01:02:05 Prakhaim: Yes, of course. 01:02:08 but I mean this is one big landscape of rocks wanting to speak. 01:02:20 Interviewer: What is true? Sorry? 01:02:20 Prakhaim: I mean, everywhere you find inscriptions, everywhere you find aspects of cultural heritage here in Jordan. 01:02:28 As I said, we need generations and generations that continue to document and study this cultural heritage. 01:02:37 It is an evidence that this area contributed in the human history. 01:02:41 It is an evidence … What we see here is an evidence that this area, this region contributed to the human creativity. 01:02:49 It’s an evidence on human creativity. 01:03:06 but also among the local community so that they can feel that they have old history and they are proud of. 01:03:12 Interviewer: So that they understand that old history and that they’re proud of it? 01:03:36 of the development of civilizations. Yeah. 01:03:40 Interviewer: It’s quite a struggle. 01:03:56 Interviewer: For you, it is evident. 01:03:57 Interviewer: For you, it’s evident, but this is also for the people evident? 01:04:01 Prakhaim: I mean, for the people, I don’t think so. 01:04:13 that it’s contributed in the human development and the human civilizations. 01:04:17 For my father, for example, he never visited Petra. 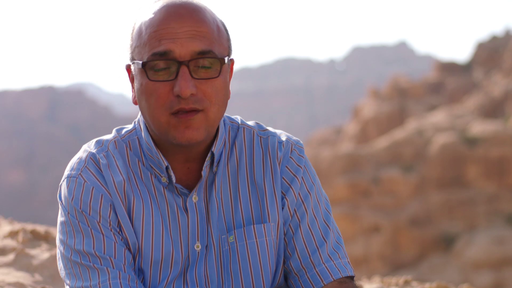 01:04:23 He’s from the local Jordanian community, but he didn’t visit Petra before. I’m speaking of myself. Yes. 01:04:36 Prakhaim: Well, okay, he’s 72 years old. He has his own interests. 01:04:50 but I promised him to take home to Petra in maybe one or two years. I’m trying to convince him. My concern-. 01:05:08 Interviewer: … discovered its history, I mean. 01:05:32 and look through the window? 01:05:33 Prakhaim: Yes, through my window. Yeah. Yes, this is a kind of paradox. 01:05:40 I can’t explain that, but he didn’t get the right education to be aware of the importance of our cultural heritage. 01:05:50 We are trying this within the generation now. Yeah. 01:05:56 because your father stands for much more people than … he stands for the Jordan, for the general opinion about it. 01:06:04 Prakhaim: No, not necessarily general opinion. No. 01:06:29 is it also a lonely feeling that you are one of the few that understands it? 01:06:33 Prakhaim: Yes. Sometimes, yes. Yeah, this is true. 01:06:37 I feel myself sometimes alone even among my colleagues at the university. 01:06:44 Interviewer: Why? How come? Why? 01:06:45 Prakhaim: I mean, not in my faculty, but in general. 01:07:10 or young generation is interested in majors through which they can earn money. 01:07:19 I have to admit, through archeology and heritage, this is sometimes difficult. Yeah. 01:07:28 Interviewer: That makes you lonely? 01:07:31 Prakhaim: Well, yeah. Maybe yes. Yeah. 01:07:35 Maybe, but I have some colleagues here in Jordan with whom I can communicate and exchange ideas. 01:07:51 but mostly we remain in the academic realm. That’s the problem..
01:07:57 The challenge now, how to raise awareness about the importance ..
01:08:10 which should be disseminated and get known to a wide range of people. This is a challenge. 01:08:18 I mean, okay, as an academic, I do my part, but there are other parties that can work with us. 01:08:32 and I think we have to work on this now in the next stage. 01:08:49 or has to be understood? 01:08:52 Prakhaim: Yeah. It have to be studied, discovered, explored. Yeah, but I’m just one person. 01:08:58 That’s why I said that we have to build a generation to get involved in studying this culture. 01:09:07 Interviewer: Yeah. What is your dream? When you’re thinking 10, 15 years, what is your ideal Jordan look like? 01:09:24 Prakhaim: In my field? 01:09:25 Interviewer: In your field. 01:09:41 academic school not in terms of university or in the way of thinking in this field. 01:10:03 and my academic stays in Europe and the United States. 01:10:22 this academic school of thought in the field of cultural heritage in general. Yeah. 01:10:35 is it like … that’s quite a lot of work also, all those stones. Are all those stones ready? 01:10:44 Prakhaim: Yeah, not all the stones. 01:10:54 to find the site where we worked before. 01:11:07 I mean, Northeastern Badia. Yeah, of course, they need expertise. They need scholars. 01:11:13 They need more trained students and also research institutions. 01:11:32 such archeology, such science can be easily accessible to us. Yeah. 01:11:39 I mean, this is one of my dreams, to establish a research center there. 01:11:45 Speaker 1: Where do they publish their findings? 01:11:48 Interviewer: Where do they publish their findings? 01:11:59 Arabic, German, English. Yeah. 01:12:13 and England, for example, and they prefer to write in the languages they mastered. 01:12:20 Interviewer: Here in Jordan?. 01:12:23 Prakhaim: Yes. Of course, we have ..
01:12:34 and it has a high standard in comparison to other institutions in the region. 01:12:48 is it easy to share it with the general public? Is it allowed? 01:12:56 Prakhaim: Yeah, of course. Yes. Yeah, yeah. I mean, we can share it with the public. 01:13:01 We hold conferences about our new discoveries. 01:13:12 2016 on this subject about new discoveries in Jordan, new epigraphical discoveries in Jordan. Yes. 01:13:33 and research papers in Arabic and Arabic is accessible for everybody in Jordan. 01:13:56 to let them know and look through this window, you see a different world. 01:14:06 Prakhaim: Yeah, this is true. 01:14:13 or to use the modern media to make the people aware about what we are discovering. 01:14:34 into different academic fields. 01:14:57 they are in fact not totally concerned with the ancient sources that we encounter in Arabia before Islam. 01:15:07 Interviewer: What is the essence of what they are finding, what you are finding? 01:15:13 Prakhaim: Yes. In fact, it’s very essential to understand cultural, historical aspects on the basis of inscriptions. 01:15:50 With the Asian Modern Turkey, which was Asia Minor, and also with other remote areas. 01:15:58 For example, in the Semite say, they reached Morocco and reached Tunisia and Morocco. 01:16:17 and constant contact with the other people in the world. 01:16:28 but we look around in a part of the world where all kind of conflicts emerge now around Jordan. 01:16:35 Interviewer: Which is all about historical, well, misconceptions also. I mean, [crosstalk 01:16:43] there’s all kind. 01:16:45 You have countries that say you have to believe this and you do it like that. 01:16:49 You have groups that says it’s like this and you should do it. How is that?. 01:16:54 I can imagine that that is a lonely feeling when in this part of the world where they treat history ..
01:17:03 Prakhaim: Yes. In fact, that’s why we have to understand history in the proper way. 01:17:09 We don’t have to politicize history. This is the most dangerous thing. 01:17:20 Every group tries to say that, "I’m the one who follows the right way," but this is not true. 01:17:30 I mean, we have a basic ground, a basic ground which we have to understand it as it is. 01:17:41 We don’t have to reflect our political backgrounds on the culture. 01:17:57 and religion as well in their political context, definitely the result will be dangerous. Yeah. 01:18:07 Interviewer: You see that? 01:18:09 Prakhaim: Yes. In fact, that’s what’s happening now in the surrounding region. I mean, it’s difficult. 01:18:42 for the enhancement of identity and the enrichment of identity? 01:18:46 Prakhaim: Yes. In fact, maybe as you have seen, that I’m working in different fields, but they are interrelated. 01:18:57 I’m using the information contained in the inscriptions in order to reach a certain result. 01:19:16 to put these results together in order to show how cultural heritage in general is important for identity. 01:19:28 In fact, identity is not contained only in inscriptions, but also in other sources. 01:19:36 I mean, for example, the Arabian poetry is part of our history. It’s part of our identity, or the Arabic poetry. 01:19:45 Also, the Holy Book, Koran, is also part of our identity. 01:19:55 and important to understand what the others wrote about Koran. 01:20:09 that study Koran from a different perspective and a different methodology. 01:20:49 so that we can understand from the methodological level how the European scholars study Koran. 01:21:15 or Russian, I don’t know, I think it would lead to a kind of … I don’t know. 01:21:24 It could lead to a kind of misunderstanding of the others and their work concerning Koran. 01:21:58 50 years, we have … I mean, Arab scholars who has no access to foreign languages, this will remain for them closed. 01:22:08 I mean, this literature written in other languages remains for them closed. They don’t know a lot about it. 01:22:18 That’s why I suggest that we start translating this into Arabic. Yeah. 01:22:25 Interviewer: That’s the core of who you are. I mean, languages are the key. 01:22:32 Prakhaim: Yes, are the key of cultures. Yeah. 01:22:35 Interviewer: Also to understand identity, your own identity. 01:22:39 Prakhaim: Yes, of course. 01:23:00 and this would shed the light on the people who wrote these texts and also make them feel proud about our identity. 01:23:09 Interviewer: And understanding their identity. 01:23:11 Prakhaim: Yeah, and to understand it in a proper way. Yeah. 01:23:16 For that reason, the languages, the understanding of languages form the basis for … You know what I mean? 01:23:25 Prakhaim: Yes, of course. The languages are the keys. 01:23:30 They are the keys to cultures, and cultural values are contained in cultures. 01:23:41 Studying the languages is of course the key to understand the cultural backgrounds. 01:23:56 but we have the text that have been left by those who composed them. 01:24:13 and they would help us in enhancing the identity. 01:24:18 Interviewer: That’s why your work is so important. 01:24:20 Prakhaim: Thank you very much. 01:24:20 Interviewer: Don’t you think yourself that it's important? 01:24:24 Prakhaim: Yeah, of course. 01:24:25 I mean, I think it’s an important discipline, which should be supported in every Jordanian institution. 01:24:37 Academic institution, I mean. 01:24:38 Interviewer: And by every Jordanian. 01:24:41 Prakhaim: Yes, of course. 01:24:47 and then we should think in a further step how to disseminate this knowledge among the local communities. 01:25:02 Prakhaim: Yes, of course. Yeah. 01:25:12 if we remain investing it in this way. 01:25:18 I feel that Petra is part of our identity here in Jordan and we have to preserve it. 01:25:26 and safeguard it as a cultural space for the future generations because it is ..
01:25:35 I mean, a site like Petra is a place which is unparalleled in the world. 01:25:54 and also to present it in a proper way. 01:26:09 I think it’s also a source for income generation for the national income. 01:26:29 and to safeguard it for future generations. This also can be applied to other sites in Jordan. 01:26:39 As you mentioned before, Jordan is a museum. It’s an open museum. 01:26:56 and they constitute of course a part of our local identity. 01:27:01 Interviewer: They only have to see it then? 01:27:03 Prakhaim: Yes. I mean, this is an important thing as well. 01:27:06 We have to make the people aware, aware of the importance of such archeological sites or heritage sites in general. 01:27:15 Interviewer: Because by understanding it, they understand their own identity? 01:27:26 or just they’re more … that there’s more than the Islamic history? 01:27:40 Prakhaim: I mean, Islam is also a part of our history, part of our identity as well. If you want to … I don’t know. 01:27:49 Do you want me to say it again? 01:27:54 Interviewer: Well, you can say it in … Yeah, you can say it again the way you like. 01:28:19 but they constitute … both religions here in Jordan are part of our identity as Jordanians in whole. 01:28:27 Interviewer: And Arabs as a whole? 01:28:31 Prakhaim: Yeah, yeah. As Arabs of course, yes. 01:28:33 Interviewer: Yeah. So a lot of work to do for you? 01:28:38 Prakhaim: Yes. In fact, I am an individual, but I’m trying my best. 01:29:11 and to cooperate so that we can enhance our identity as Jordanians, as Muslims, Christians, and as Arabs.